The Sani-Tech Systems Inc. Rotary Bottle Buster line of products are ideal for recyclers and companies who desire product destruction, liquid removal, and volume reduction. The Rotary Bottle Buster is a unique product that can quickly and efficiently remove liquid from HDPE, PET, Aluminum Cans, damaged, off-spec product and a host of other containers. Versatile: The Rotary Bottle Buster can process a wide variety of containers without adjustment. 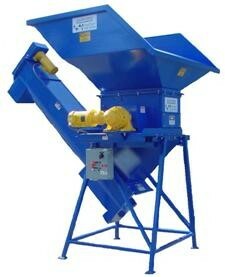 It is available in 5, 10, and 15 HP and 24" or 36" drum sizes.